Marina here. It is 2018 and the start of the New Year offers us a time to reflect on experiences passed, present and future. On the Great Wall of China. What a site to behold. 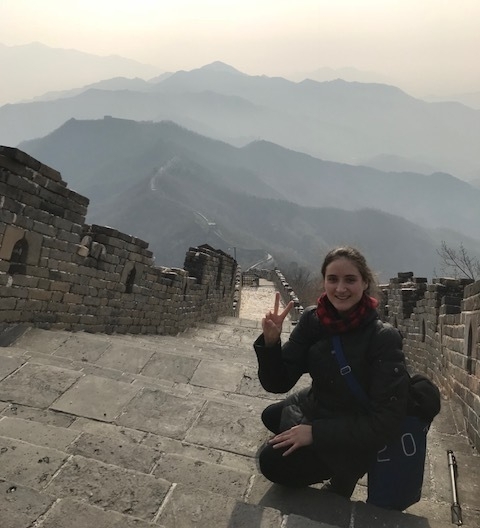 I spent the end of 2017 in Beijing, China, on a quest for a beautiful and ancient music: Qin music, or as it is referred today, the Guqin musical tradition (the Gu denotes it as the first, the ancient form of this music within the broader qin category). This was the first research trip to the mainland Asian continent for Golden Tracks. The week that I spent in Beijing was transformative for me, inspirational, and a true blessing for the future of our documentary series. The musician who will be featured in the Chinese episode of Golden Tracks is YANG Chunwei, a renowned and masterful player of the guqin musical instrument. She is currently a professor at the China Conservatory of Music. She has received a Masters in the Guqin, and a PhD in Ethnomusicology. Her intelligence and knowledge of this music spans farther than the Great Wall itself, I would say, as I was privileged enough to spend two wonderful days with her and have her introduce me to the wonder and philosophy behind this music. Yang Chunwei and her students at a private lesson in her studio in NE Beijing. First, I attended a private lesson with her and several of her students during which I was able to observe just how this ancient music is passed down to students and people keen in preserving this musical form. It was an intimate and personal experience to be witness to the practice of teaching, as well as to the activity of music making and musical reinterpretation and performance. She performed for the class and for me a rendition of “Flowing Waters”, the oldest song amongst the 27 included on the Golden Record. It was the first time I heard the piece in live performance. In truth, I was taken to a spiritual place. It was the most beautiful sound I had ever heard. The following day, she took me to her home in the countryside. It was a quaint and small village, and her home was the perfect representation of architectural harmony, symmetry and peacefulness. The space, light and design of the home offered me an inner peace and clear direction, in my life as well as for the project. We spent the afternoon drinking tea - prepared by a tea master and now a dear friend -, and talking about art, film, music and the importance of preserving cultural traditions. In the home of Yang Chunwei, with some very special new friends and contributors to Golden Tracks. When I say “we” talked, I mostly mean “they” because they spoke in Chinese while I listened very intently to the words I count not understand. Chunwei served as my translator in the times that I did speak and for explaining the project of Golden Tracks. Together, in translation or through feeling, we exchanged mutual appreciation for the work that each of us does in our respective fields. What I could not understand in their words, I saw in their hearts and reciprocally, I felt in my heart, in my soul and in my body. We exchanged hugs and deep, meaningful moments together as we contemplated her husband’s art, talked about entrepreneurial ideas, and listened to Chunwei play her most cherished qin instrument. It was a day that I will cherish forever. A few days later I visited the Temple of Heaven in southern Beijing, an imperial complex of buildings that served the Emperors of the Ming and Qing dynasties (1368 - 1911) as the place for worshiping the heavens and for holding Prayers for Good Harvest. One of the annex buildings is the Divine Music Administration. This administration served as the highest ritual music academy of the Ming and Qing Dynasties and as the managing organ of the imperial court ceremonial musical instruments as well as the exercising place of the ritual music and dance. I attended a demonstrative performance of the ancient imperial court instruments as well as the civil and military dances for the Prayer for Good Harvest ceremony. Chinese musical instruments are classified into 8 tones. These tones are the materials of the instrument: silk, bamboo, wood, stone, metal, clay, gourd and skin. The qin instrument falls under the silk tone as the 7 strings are made from silk. I was able to experience and touch replicas of all of these ancient instruments. 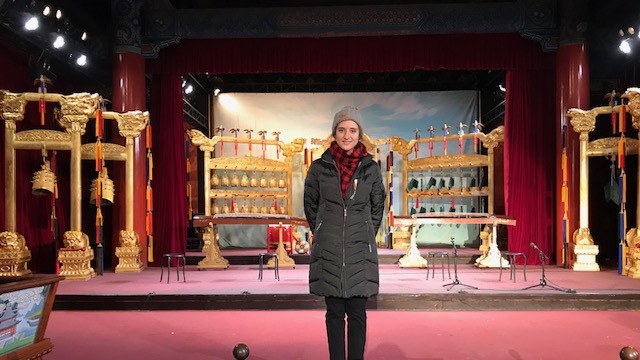 In the Divine Music Administration Building of the Temple of Heaven. Once again I shall say, to witness the live continuation and preservation of a tradition as important and vital as the guqin music was a unique experience that Golden Tracks: Music Aboard the Voyager will explore in full detail and color once we return to Beijing to film the full segment. Please stay tuned for a video recapping the highlights of El Jinete's first research trip to China.